…and Andy was the one driving the car. Drunk. He didn’t mean for it to happen. He didn’t want anyone to get hurt, especially not his best friend. They were just having a bit of fun after the game. Now Andy has to live with the memory and the guilt of Robbie’s death. He’s not sure he’s up to it. This is an emotionally charged story, and one I didn’t necessarily enjoy. There aren’t any surprises in it. I guessed from page one how it would end, but the telling is very unique. Ms. Draper doesn’t give us a straight forward narrative. In fact, there’s no narration at all. It’s a collection of essays, letters, news articles, and dialogue, but it gets the job done. The aftermath of the accident is brilliantly related, with all the grief, questions, guilt, and nightmares that naturally follow. To me, an adult, all the drama felt like overkill, but I’m not the primary audience. This one is written for teens. Though the book is almost twenty years old, I think they will still find it relevant, engaging, and eye-opening. But there’s a second major theme in this one. Andy is black, and he struggles to succeed in a white world. In fact, he equates success with white and therefore doesn’t really pursue it at all. This, again, felt very foreign to me. I, like Andy’s parents, wanted to lecture him to get his grades up. Come on! Make something of yourself! But I’ve never been laughed at by my peers for getting an A or been followed through a store by a suspicious clerk. I don’t have any idea what it’s like to be a black kid. Ms. Draper, an African American woman and a high school teacher for many, many years, has a much better grasp of the situation. And she does a fine job relating it. I simply struggle with the receiving. 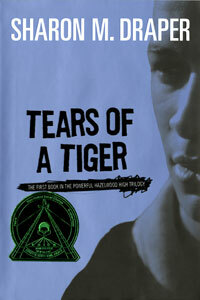 In conclusion, Tears of a Tiger was a stretcher for me. A perspective I’m not accustomed to. It was good for me to read it, but I’m not in a hurry to read the rest of the trilogy. It’s definitely a thinker for teens, however. I’d recommend it on the strength of Ms. Draper’s writing and on the message she gets across. I’d give this one a 13+ recommendation due to the heaviness of the subject and the teen culture that’s related, but it is cleanly written with the exception of one mild profanity. A great discussion starter and a warning to kids to think about the consequences before you act. This sounds like a wonderful book for this time of year. Teens mostly feel immortal and the shock of finding out one’s peer was not is bad enough. You mentioned struggling. I would probably struggle as well, but I think teens sometimes need that overkill to get a message across and make it stick. This also sounds like the perfect book for a high school honors English class. I hope your review gets some kids checking out this book or even buying it. A good book is a good book, regardless of its age. Difficult, but nice selection for a new year just days away. This one wasn’t even supposed to post until next Wednesday, but I’m a good one for messing that stuff up. 🙂 You’re right, it is timely this time of year. I didn’t really think about that. I hope it does make some kid think and maybe make a better choice. Love your Christmas header and web page. Was very surprised with your review. Have not read this book, but have read many of her othe books, “Copper Sun” “Out of My Mind,” and she is one of my favorite authors. I think it is a timely message and she has a large following. (She lives about 45 min from me.) Will have to check it out. She has a new novel coming out I’ve preordered. I was going to suggest that you look at who publishs her historical fictin books, as that may be a publisher you want to pursue with your trilogy. Sorry, my years in PR rushes out! The book was extremely well-written. I’ve met Ms. Draper and heard her speak. She’s fabulous and dynamic. I just didn’t identify with this protagonist very well. I kept wanting to snap him out of his funk and give him a pep talk. I think kids would identify much better and have more patience with him. The message, however, is timely–timeless. What a great, honest review Mrs. Isenhoff. The storyline reminds me of “On My Honor”. Thanks, Erik. Yeah, they definitely share a common theme. i’m with you. i was helping my son with his analysis of this book. as an adult i just didn’t connect with it. he’s not a reader and really didn’t have an opinion of it, positive or negative. i do think it is a bit outdated in our current technological world. Thanks for dropping by, lovecross. It’s been a while since I read this one, but I do remember I did not love it. Interesting to get someone else’s perspective. Most people haven’t agreed with me on this one.